Sophisticated styling that glides out when you need it. The sleek, pull-out visor hood allows you to close it when not in use and installs flush with cabinetry for a sophisticated European look. The hood boasts four-speed touch controls with LCD display and an integrated 400 CFM blower. Enjoy the convenience of dishwasher-safe aluminum mesh filters that are easy to clean. Open your design options. The Bosch drawer microwave installs cleanly under counters, cooktops, and flush to cabinets, making it a perfect solution for any designer kitchen. The drawer microwave opens and closes with a push of a button and is large enough to fit a 9" x 13" baking dish. 800 Series - 30 inch Induction Cooktop - Black w/ Stainless Steel Frame Three brilliant ways to cook. One exceptional way to engineer them. Whether you choose gas, electric or induction, sleek European design and precise cooking performance is built into every Bosch cooktop. High heat and low simmer options on burners offer optimal cooking flexibility. Our Benchmark" gas cooktops feature a dual-stacked burner that delivers both low simmer and 20,000 BTUs. With easy-to-clean glass surfaces and grates as well as solid stainless steel frames and die-cast metal knobs, our quality German engineering really shows. 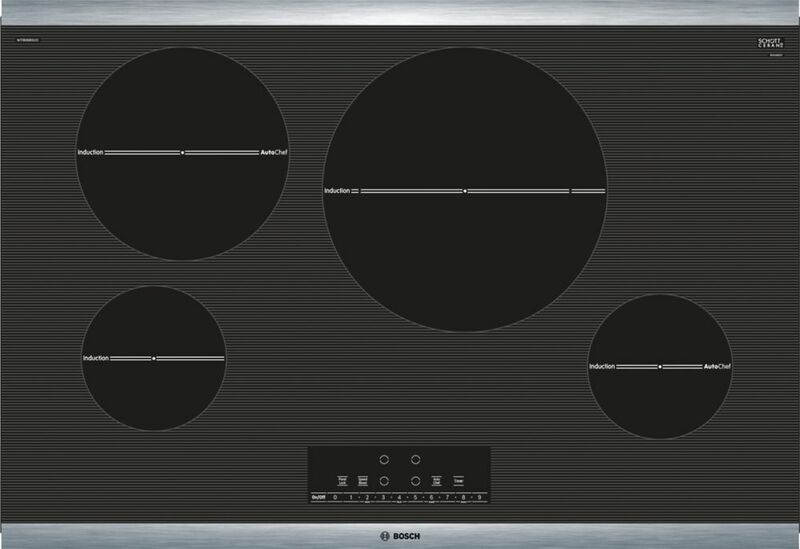 800 Series - 30 inch Induction Cooktop - Black w/ Stainless Steel Frame is rated 4.7 out of 5 by 9. Rated 5 out of 5 by HomeDepotCustomer from fantastic!Cooks evenly and is better than gas!! !Changed our lives!!... fantastic!Cooks evenly and is better than gas!! !Changed our lives!! Rated 5 out of 5 by Tom from Easy to use. Much better cooking control than ordinary... Easy to use. Much better cooking control than ordinary electric radiant. Worth the extra money. Rated 4 out of 5 by Only30AMP from Self install. Replaced radiant cooktop with the Bosch 800 Series 30" induction. Hole in granite ... Self install. Replaced radiant cooktop with the Bosch 800 Series 30" induction. Hole in granite counter top was big enough and not too large for the fit. Had to cut a piece out of top drawer account electrical cable was not located all the way in the back. I was unable to use all the brackets that keep the top from sliding account of the top drawer in my cabinet located under the cooktop. The top is still stable and does not slide. I did not have to change the wiring from 10 gauge to 8 gauge account this unit only required a 30 amp breaker with 10 gauge wire. Tested all the elements, so far so good. Pros... clean up a breeze (no knobs). only takes 2 minutes and 30 seconds to boil 36 oz. of water. Heat adjusts very similar to gas range, so no radiant burner turning off, on, off, on. Pans and pots maintain a constant temp. Cons: Had to get new reading induction cookware. Had to make cuts in top drawer for the drawer to close account unit sat 1/2 inch lower and electrical cable was not located at the rear most section of the unit. Unit cost approx. the same as other units with wifi/blue tooth and element bridge on left side of unit. But choose this unit due to only requiring 30 amp and great reviews on this Bosch unit.